Despite the weather I couldn’t resist a glance in the freezer section at the supermarket, and I had ice cream on my mind. We ate a lot over the Summer but haven’t bought any for ages so I was missing it. 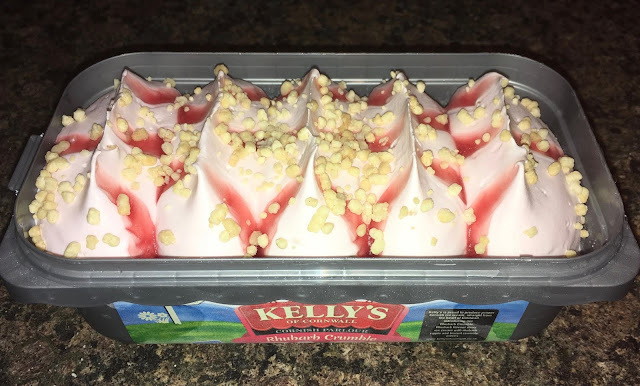 There hasn’t been a lot of new launches yet which makes sense given the season, but I did spot something I hadn’t tried before, this Kelly’s of Cornwall Rhubarb Crumble Ice Cream. The ice cream looks quite stunning, it is pink in colour and is topped with a deep pink sauce and a sprinkle of crumble topping. We served some out and gave it the taste test. The ice cream itself is quite creamy, as you would expect from Kelly’s of Cornwall. 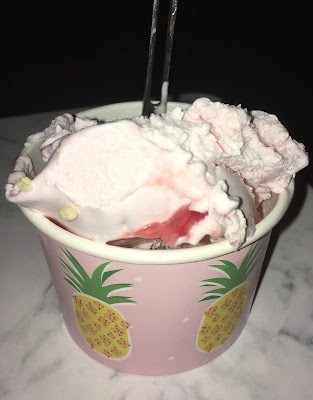 There is a nice tart fruit flavour from the rhubarb, and the sauce is zingy and adds a lovely extra element to the over all ice cream flavour. The crumble adds a bit of texture but is mild in flavour and doesn’t add much to the dessert, but it didn’t need to as the rest of the ice cream is spot on. Rhubarb is an unusual flavour for an ice cream, but it worked very well. The ultra creaminess fro Kelly’s with the sharp flavour meant this was more like rhubarb and custard than rhubarb crumble and it is certainly a tub I will be buying again especially to fill the gap before the new Spring flavours launch.